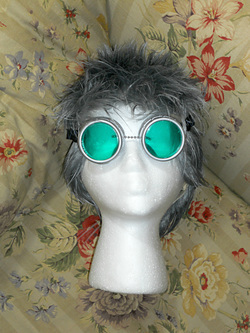 I liked the style of Arda Wigs' Jett, so I bought one in Silver. It is essentially white. Considering I wanted to have complete control over the color, this was my best option in this style. You always want the color to be as white as possible if you have the means to create the exact color you want! I bought a multipack of silver Sharpies. I put on gloves and set myself up in the living room. Ideally you should do this in a well-ventilated area wearing a mask. Outside is the best place, if weather allows. Somewhere with an exhaust fan would be a good second. 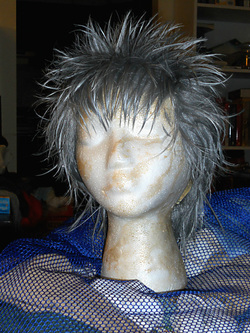 I learned this after I did this wig. Learn from my mistakes! I worked my way up from the bottom row of wefts, coloring thoroughly as I went. I ended up having to buy a second round to have enough. It's amazing how much ink it takes to color such a short wig. You may have to go out and buy more as you go. Be prepared to kill a lot of Sharpies. Here it is after I finished coloring it. It looked wonderful! All shimmery and silvery. I let it sit and let as much of the Sharpie do its thing to try to ensure it would stay that awesome. I don' t know if it helped, it probably didn't, but I was tired and it made me feel better before going to the next step. I thoroughly rinsed that wig under cold water in the tub. I turned the cold on full blast and ran it under the faucet. You need to wash off as much excess marker as possible or else it will get all over you and your costume. You don't want that! Sadly the metallic pieces mostly washed off, but it was still the shade I was aiming for. I was satisfied. I popped it on a foam head and let it dry. The only thing left was to add product and style as usual. I've washed and restyled it with no loss of color. So if you have the time, the money for Sharpies, and ventilation, go for hand coloring your wig! But always make sure you're not directly breathing in all those fumes. SAFETY FIRST!